The only thing scarier than a foul tipped baseball heading toward your child or their first roller coaster ride is the thought of getting separated from your child in a crowd. Here is a list of seven safety tips for your child or children in crowded areas where they may get separated and lost. 1. Be honest and inform your children that they could get lost. You do not have to scare them, but prepare them for the situation if they do get separated. Talk to your family all together if possible. Make sure the first thing your child does is to not wander away, but to stay in one place. He or she is to look for another mommy with children or a woman that looks like a grandmother. If they do not see one of them immediately, have them look for a park worker. Make sure you point out the style of park uniform when you enter the park. Have the park worker always call for Security along with the parent. 2. Have a Tattoo on all of the children in your group. 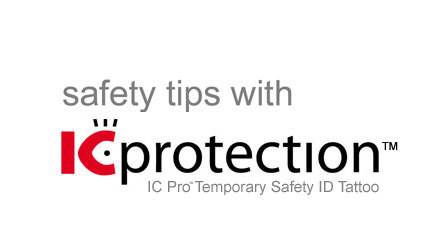 Before you enter the park or sporting event or wherever you’re going into, make sure everyone has their ( IC Protection™ ) tattoo on and have them tell you where it’s located on their body. Example: upper arm or upper shoulder. Talk to your family about what to do if they get lost and they find someone mentioned above to help them. 3. First, have your child state they are lost and show the individual their Tattoo with all of their safety information. Ask them to please call the number on your tattoo. Most importantly, make sure you tell your children to insist on staying where they are found by the adult. Children should not wander off with strangers. If the person who finds your child doesn’t have a cell phone, someone else passing by will in the next few seconds. 4. Bring a Family Photo. You can do this with your cell phone as a group picture or individual pictures of each child before entering the venue you’re visiting. Pictures taken at the point of entrance also shows what each child is wearing that day. If you’re not good at taking photos with your cell phone, then just bring a recent photo of your family or individual pictures if that’s what is available. 5. If you have small children in a stroller, be “Stroller Conscience.” Be different from all of the other strollers, especially if you are renting one from a park that has hundreds of the same kinds. A very easy and affective method is to tie a personal item to the stroller, such as a bandana, sweatshirt or baby blanket. 6. If you have a park map, check it out with your family the night before or before entering the park. Start the day off having your older children be semi-familiar with their surroundings. 7. Never use a Sharpie on your child’s skin. These markers contain industrial solvents and chemicals that should not be put on the skin. These chemicals and solvents penetrate the skin and enter your children’s blood stream. Any identification	sticker on clothing or identification badges wore around a child neck can be pulled of very easily. Once that item is gone they are on their own. This is not what you want for your child. Let’s prepare our children and be Pro-active. Nothing could be worse than having a missing. Nothing in this world could be scarier than knowing your child is lost with no identification on them. With IC Protection™ on your child, a separated parent and child have reduced stress and less panic. They are comforted by the knowledge that not only cell phone numbers, but language spoken, allergies and any medical conditions are clearly printed on the Safety Tattoo. Take charge for a small cost. Have that peace of mind and leave that fear outside your trip or vacation. 1: NISMART2: National Incident Studies of Missing, Abducted, Runaway and Thrownaway Children. U.S. Department of Justice. October 2002. 2: Wander Wear Inc. parent survey, September 2006.